Back when I was working at a corporate job, and even now, I struggle with one, finding time to go grocery shopping and two, planning balanced meals that are tasty and healthy, and then actually executing them. So when my boyfriend suggested trying out HelloFresh, I was more than willing (and even a teensy bit excited…) to give it a go. Bonus: All the packaging is recyclable and/or compostable! Our very first meal plan was set to arrive on Monday, and although it was marked as delivered, it never came. Fortunately, the next afternoon, our box arrived and even more surprisingly, everything was still fresh. The giant ice packets inside stayed frozen and the insulation lining the entire box kept everything chilled. Packaged at the top of the HelloFresh box were four brown bags, which housed the ingredients for each of our four meals separately. The meats were grouped together underneath, and placed closest to the ice packets. We removed a few items like the canned pasta sauce, but for the most part, kept everything organized inside the bags and then stored them in the fridge (they took up a little over half a shelf). We began cooking that night, all the way through Friday. After day two, I was already digging the routine of stepping away from the tv, phone, and laptop and spending a good 30 minutes in the kitchen creating something from scratch, and then sitting down to enjoy the finished product. And yes, everything was yummy. The fresh ingredients combined with delicious sauces put HelloFresh’s dishes a step above my bland and often uninspiring meals. The majority of the dishes focused on proteins and veggies/fruits, with healthy carbs like potatoes and couscous. The portions were perfect and left me feeling full but not over-stuffed, while calorie-wise they averaged at around 600, with the highest out of all 8 meal options being 830 calories. Here are all four meals, along with our thoughts and ratings for each! What we liked: We learned how to properly cook duck breast for the first time, and make a delicious sauce using the rendered fat. What we didn’t like: The sauce was a bit too buttery, and we would have liked to learn how to make the demi-glace from scratch. What we liked: The feta, pecans, and charred nectarine combination was super tasty and something we never would have thought to add to a salad. What we didn’t like: We thought the steak could have used more seasoning beyond just salt and pepper. What we liked: Mushroom gravy sauce was delicious and the couscous was a new ingredient that we never thought to use before. What we liked: This was by far the simplest recipe out of the four. Loved the addition of fresh spinach leaves and tomatoes. What we didn’t like: Would have loved if they gave us fresh pasta instead of boxed pasta. In addition to discovering a fun new evening activity and also improving my diet by eating healthier meals, I actually learned some new cooking techniques over the course of the week – like rendering fat from meat and using it to cook veggies and make sauces. Another plus for me is that there’s zero food waste. HelloFresh pre-packages ingredients into portions that, 90% of the time, perfectly match what the recipes call for. You don’t have to play a guessing game at the grocery store, or stock up on full-size containers, only to have the extras sit in your cabinets and fridge until they expire. Expanding on this minimalist approach, HelloFresh’s recipes are also designed to use the least amount of pans, pots, bowls, and dishes, so clean up is pretty quick. The recipe steps are also super simple and easy-to-follow, even for culinary newbies like myself. With all that in mind, while I do think it’s a bit pricey for what you get food-wise, the convenience and experience of cooking up a healthy, balanced meal is what ultimately makes it worth it for me. 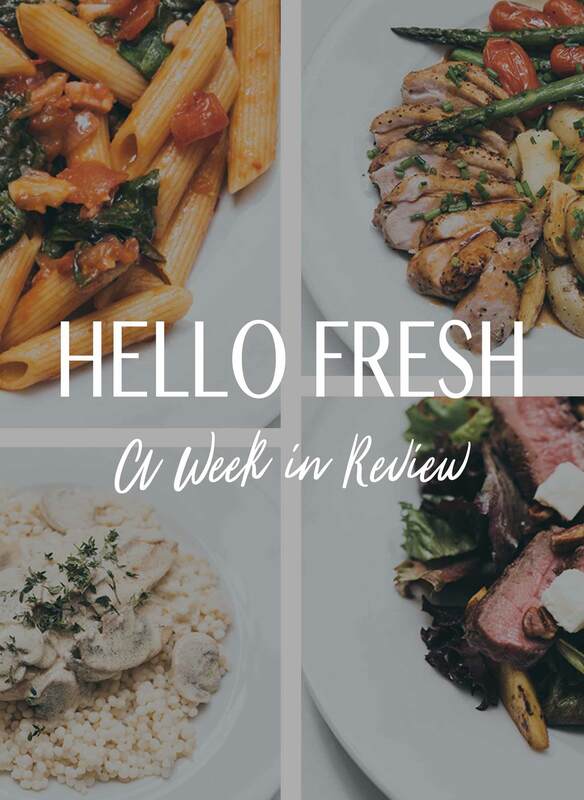 I’d highly recommend HelloFresh to anyone who struggles with finding the time and/or having the culinary know-how to plan a week’s worth of tasty and healthy home-cooked meals, while keeping clean-up and food waste to a minimum. Have you tried HelloFresh, or another meal subscription service?